Controls most common species of small to medium sized slugs. Start your control early and you will be able to target the young slugs growing underground before they do any damage. Slugs continue to be an ongoing frustration for gardeners and continue to appear in the list of worst garden pests. They can generally be easily spotted, and you will probably be aware of them if you have an infestation. Their damage can be identified by irregular holes with smooth edges on leaves along with slime trails. If you have crops like strawberries and tomatoes growing, slugs will chew round holes in the fruit as well as the leaves. Nemaslug® contains beneficial nematodes (naturally occuring microscopic worms) which seek out and kill slugs. It is a safe and effective way to deal with a slug infestation. Nematodes attack slugs by entering their bodies through the breathing pore. Once inside, they reproduce in huge numbers, making the slugs terminally ill. Soon after a slug has died, a new generation of hungry nematodes disperses to hunt down further slugs. One application of Nemaslug® will provide up to 6 weeks control of most common species of small to medium sized garden slugs. 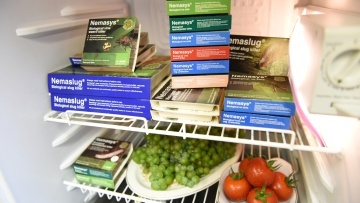 If you start applying Nemaslug® early in the season, you can target the young slugs growing underground. Unlike chemical pellets, the slug killer nematodes continue to work well during wet weather, exactly when you need protection against slugs.